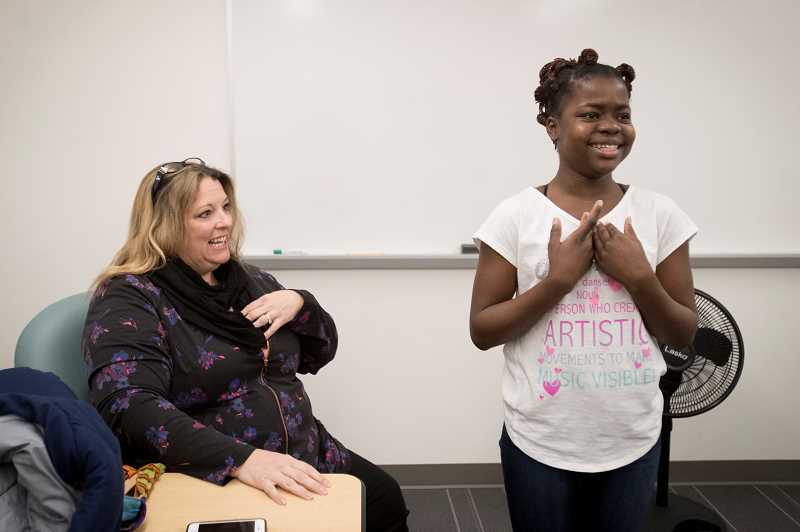 Sitting across from each other in an administrative room in Meridian Middle School, Wilsonville resident Kristi Park asked 14-year-old refugee Vanelle Imbi a flurry of questions: What do you want to be when you grow up? What foods have you tried since settling in America? Has making new friends in a new environment been challenging? A little shy at the moment and not yet fluent in English, Vanelle answers the questions with brevity. But it was her answer to one question that tells all you need to know about the relationship she and her family have forged with Park. "What do you call me? " Kristi asked. Along with helping resettle the Imbi family from the Central African Republic to Wilsonville, Park has assisted dozens of other refugee settlements and coordinates volunteers for refugee efforts. For her work, Park was named the Volunteer of the Year by the Catholic Charities of Oregon. "Kristi goes out of her way to know each of the Refugee Resettlement staff, works one-on-one with families and is a major support for the department as a whole. Her networking and advocacy also have led to numerous new volunteers joining the Refugee Resettlement volunteer team," Refugee Services volunteer coordinator Stephanie Coleman stated in a Catholic Charities of Oregon news release. Before she began helping refugees, much of Park's volunteer work consisted of raising autism awareness and helping out with Wilsonville's "Little Free Library" program. But after watching a news program about a woman who helped a refugee assimilate to her new home, she realized the need for refugee assistance. "I just saw a need there and really wanted to help," Park said. She contacted Catholic Charities of Oregon, a social services organization, and they told her about a program where volunteers help refugees move into their new apartment. She subsequently gathered a few fellow Church of Jesus Christ of Latter-day Saints members and helped a family from Iraq settle into an apartment. Park since has helped families from countries including Iran, Somalia, Afghanistan, Syria, Nepal and Burma move into housing. "I've met so many strong people who have come to America for opportunity and to escape situations . ... What I hear the most is 'We don't want our children to grow up in this,'" Park said. "They have very little money, and so it's important that what they do have they spend on rent and utilities, and one way we can help is by providing everything for their apartment: furniture, kitchen items, bedding, cleaning supplies." When Park received a phone call from Catholic Charities of Oregon that the Imbi family was moving to the Wilsonville Summit apartments, she was excited to help. The Central African Republic has been embroiled in a sectarian civil war in recent years and the Imbi family fled to the Democratic Republic of the Congo for four years before being accepted for resettlement by the United Nations last year. "It's difficult to thrive there," Park said. "There was just a story on NBC ... It's the most dangerous place in the world for children right now." Park says most refugees who settle in the Portland metro area move to Portland, Gresham, Hillsboro or Beaverton because there are more affordable housing options in those cities. However, after their first home in America was infested with fleas, the Imbi family received assistance from an undisclosed source to be able to move to Wilsonville. "Resettling is based solely on the cost of housing because you have to find affordable housing," Park said. "They are here through the generosity of someone when their original housing was not fit to live in." Venelle and her sister Quasie attend Meridian Creek Middle School while their brother, Bienvenue, attends Wilsonville High School. All three live with their father. Park has helped the Imbis shop for groceries, register for school activities, acquire shoes for sports, and find rides home after school activities. She also checks up on them frequently and bought them art supplies, which Vanelle used to draw princesses. With the help of members of her church, Park provided the Imbis with bikes and helped them learn how to ride. "You were so nervous. You wouldn't pedal, and then you wouldn't open your eyes," Park said to Venelle. "But now she can ride like a pro." And while Bienvenue joined the Wilsonville High soccer team, Vanelle and Quasie are a part of the school's Unified Basketball Team and track and cross-country teams. Though they came into the United States knowing three languages, they spoke no English. But their English has improv-ed immensely, according to Park. "They jumped right in, were eager," said Carly Clark, the school's English language development specialist. "They're a little shy at first, but they're so comfortable." During the conversation at the middle school, Venelle showed Park a handbag she had made on her own. "Look at those beautiful stitches," Park said. "Someone who can do that can do anything." However, Park says that due to housing costs, the Imbis likely will have to move from Wilsonville to a less expensive area later this year. Nevertheless, Park plans to continue to help them for "as long as they'll let me." Along with helping refugees settle into their new life, Park also organizes volunteers through Justserve.org. She has connected hundreds of volunteers to refugee assistance opportunities and also inspired Sunset High School to put on a pillow drive for refugees. Park said she looks up to Venelle. Working with families that have endured so much to start a new life in the United States has given her a new perspective, she adds. "It's changed me beyond belief," Park said. "This taught me humility; it taught me unconditional love. It's taught me First World problems versus Third World problems; it's taught me the true meaning of gratitude."